LG Optimus VU 2 has announced earlier, the Company launches the same category phablet now. LG announced a huge display 3G smart phone named Optimus VU P895 with attractive features. the Company climes that it is part smart phone and part tablet. The Optimus VU P895 has a brilliant 5 inches True IPS TFT LCD Capacitive touch display with 4:3 aspect ratio. The display featuring 1024 x 768 pixels XGA resolution and 550 nit Brightness. The smart phone comes with Google’s Android 4.0.4 (Ice Cream Sandwich) platform and a specially created Rubidium pen for perfect and cool writing experience. 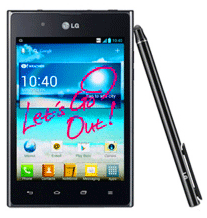 LG Optimus VU P895 is powered by 1.5 GHz Nvidia Tegra 3 Quad-core Processor with inbuilt graphic acceleration. The handset sports 8 mega pixels CMOS AF main camera on the rear and 1.3 mega pixels secondary camera for video calling on the front. The camera containing auto focus, digital zoom and LED flash. Geo tagging and face detection features are available in the camera. Full HD (1080p) video recording with 8x video zoom and flash light also available in the device. LG Optimus VU P895 enables decent memory options like 1 GB RAM and 32 GB expandable memory via micro SD cards. There is a memory card slot on the device for expand its storage. The smart phone’s power supply provides a standard 2,080 mAh Li-Ion battery which provides 16.54 hours talk time in 2G and 14.99 hours talk time in 3G. Optimus VU P895 contains advanced connectivity options like 3G, Wi-Fi, Bluetooth, micro USB, PC Sync, A-GPS, WAP, MHL and NFC.